Wolfgang Amadeus Mozart's Le nozze di Figaro - one of the most popular and most frequently performed works at the Vienna State Opera - tells of a "great day": An exceptional work in terms of music, the congenial based on the libretto by Lorenzo Da Ponte . fervently in protest his affections. They are interrupted by Basilio. The count himself is forced to hide. Basilio tries to interest Susanna in a liaison with the count. He also mentions the rumours about Cherubino’s passionate love for the countess. 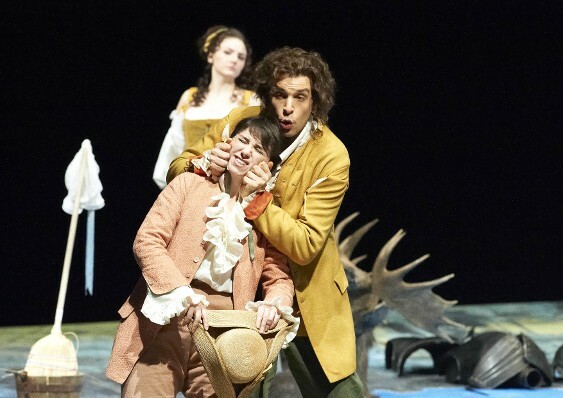 Incensed, Almaviva bursts from his hiding place and relates, with wild gesticulations, how he surprised Cherubino recently with the gardener’s daughter. To his astonishment, he discovers Cherubino here too, but must stifle his wrath since the page must have overheard everything from his hiding place. Figaro arrives with all the servants to persuade the count finally in give his consent to the wedding. Almaviva promises to give it – later. Cherubino is pardoned only the extent that he is to leave at once and joint the count’s regiment as an officer. dressing-room, who in his fright leaps out of the window. On their return the countess confesses to her husband that Cherubino is in the dressing-room. To the amazement of both count and countess, Susanna steps out of the dressing-room, and the count must apologize to his wife. To exonerate themselves, the countess and Susanne admit to the count that the anonymous letter was written by Figaro and was a trick. Figaro unwillingly confirms this to be the case. Now the irate gardener enters and tells his master that someone jumped out of the countess’s bedroom window and broke a flower pot – and lost an officer’s commission. All that was missing was the count’s seal. 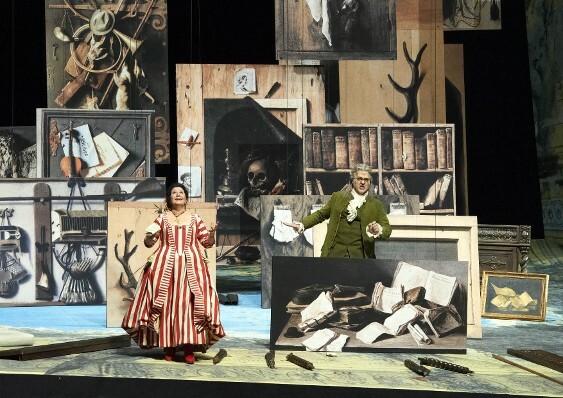 Marcellina and Doctor Bartolo appear and demand that Figaro comply with his contract. The count once again puts off giving his consent to the wedding. Susanna wants no find the money Figaro owes and accordingly agrees to a clandestine meeting with the count. However, he chances to notice that Susanna intends to deceive him and so confirms the judge’s decision: Figaro must pay – or marry Marcellina. In the ensuring argument, it turns out that Figaro, who did not know his parents, is the son of Doctor Bartolo and Marcellina, the product of an earlier affair between the two. The happy reunion of parents and son is initially misunderstood by Susanna, who has in the meantime been given the necessary money by the countess. However, the matter is soon cleared up. Countess Rosina and Susanna have come up with their own plan: without Figaro’s knowledge, they write a letter to the count, asking him to meet Susanna that night in the palace park; however, in reality the countess, disguised as Susanna, will be waiting for him. Cherubino did not go to join his regiment, but sought refuge with Barbarina. When he takes part in the festivities dressed as a girl, Barbarina’s father exposes him. The count sees a final opportunity to delay the wedding, but Barbarina threatens to reveal the nature of the count’s relationship with her. Now the wedding can finally take place. But the folly has not yet ended: as they dance, Susanna gives the count the fake love letter.